Sarah @ Nevil Road Designs lives in Shropshire and works from her studio in the shadow of Wellington's Wrekin Hill. 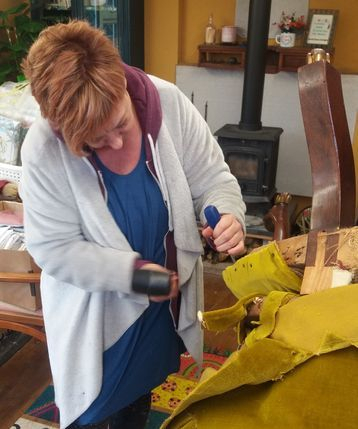 Specialising in upholstery, collage and embroidery, pieces are made for markets or tailored to the individual requirements of specific commissions. From her workshop, tired family pieces and one off finds are transformed into stylish and revitalised items. Individually made collages and hand embroidered linens can also be commissioned to mark and celebrate special occassions. Sarah has a friendly and personal approach. Please make contact to arrange quotes and consultation visits.